Before I finally cleaned out my closet for good and decided to dress with less, I faced that same question over and over again. Figuring it out took time and energy and often felt chaotic and frustrating. “I have nothing to wear” I’d think while staring at a closet full of clothes. It was emotional too. 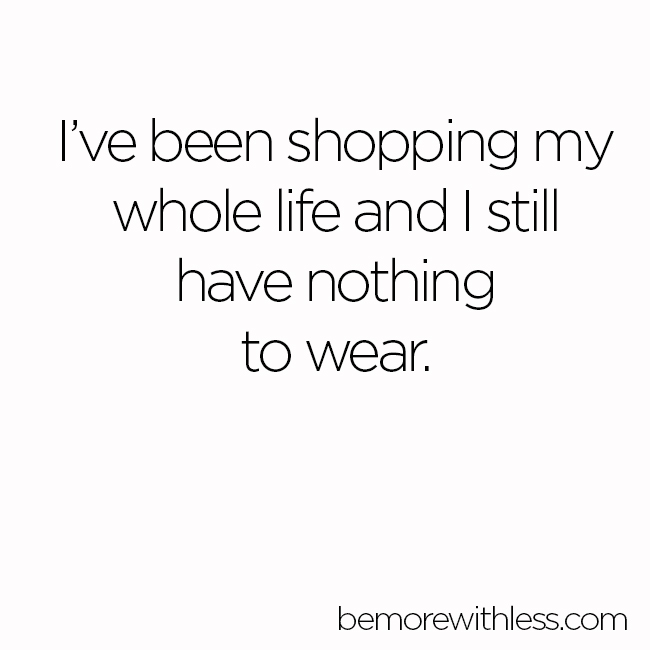 Even though I usually ended up wearing the same things over and over again, I still had to face my bad purchase decisions, the clothing that didn’t fit, and the guilt of overspending every time I opened my closet. I thought the solution was “more” so I kept shopping and adding to the chaos. I didn’t realize the negative impact my clothes had on me until I got rid of most of them and discovered that the solution was “less”. I didn’t need a make-over, I needed a make-under. Closet make-overs usually involve new clothes, more spending, more time shopping, and later more time feeling the same unsatisfied feeling you started with. Instead of closet make-over, try this closet make-under. doesn’t fit your body right now, feel good on your skin, or support the way you like to live. We deserve to wear clothes that fit our bodies and lifestyles. Remove the items that are not a good fit for you. has price tags still attached. There’s a reason you haven’t worn it yet. I used to buy things because they were a great price and hang them in my closet like some sort of trophy. As if I deserved a pat on the back for buying something for the cheapest possible price even if I didn’t like it. someone else bought for you. I recommend that adults stop gifting each other clothing. Deciding what to wear is a personal decision. If you are holding onto something because someone else gave it to you, even though you never wear it, give yourself a break. Your relationship with the gift isn’t as important as your relationship with the person who gave it to you. Focus more on people and less on stuff. you think you “should” wear. Just because you read it in a fashion magazine doesn’t make it true. Even if a stylist told you to wear red, or a special quiz suggested more patterns, it doesn’t make it right for you. Only you know what’s best for you. If clothes are worn out, torn, stained, and beyond repair, you probably aren’t wearing them anyway. If clothes in your closet make you feel sad because you spent too much on them, they don’t fit you, or they remind you of something or someone who made you sad, remove them. Once you remove all of the items, box them up and put them out of sight. Don’t label the boxes but instead see what happens after a few months. If you don’t miss or even remember what’s inside the boxes, donate them. What’s left after the closet make-under? By now your closet might be feeling a little too light but in most cases, that’s just fear talking. The fear of not having enough is powerful, but consider this an opportunity to define what enough means to you instead of letting fear do that for you. Fear doesn’t know what’s best for you. This is more than enough even though I wasn’t sure until I tried it. Even when I had 10 times this amount of stuff in my closet, I usually gravitated towards the same small collection of clothing. By making under my closet and removing the stuff I wasn’t wearing or enjoying, I am free to wear my favorite clothes every day. Once you make-under your closet, notice how your mornings are changing and how you feel when you open your closet. If you feel lighter, and more at ease or curious about how dressing with less could not only improve your mornings, but your entire outlook on life, consider joining me for the 3-month minimalist fashion challenge, Project 333. Project 333 is the minimalist fashion challenge I created that invites you to dress with 33 items or less for 3 months. Your 33 items are a combination of clothes, accessories, jewelry and shoes. Don’t count your wedding ring or one sentimental piece of jewelry that you never take off, underwear, sleep wear, in-home lounge wear or workout clothing. Hide everything else for 3 months and see what happens. If you are interested, learn more on the Project 333 page here, or for extra guidance, motivation and support join the Project 333 Microcourse: Dress with Less and Create Your Capsule Wardrobe. 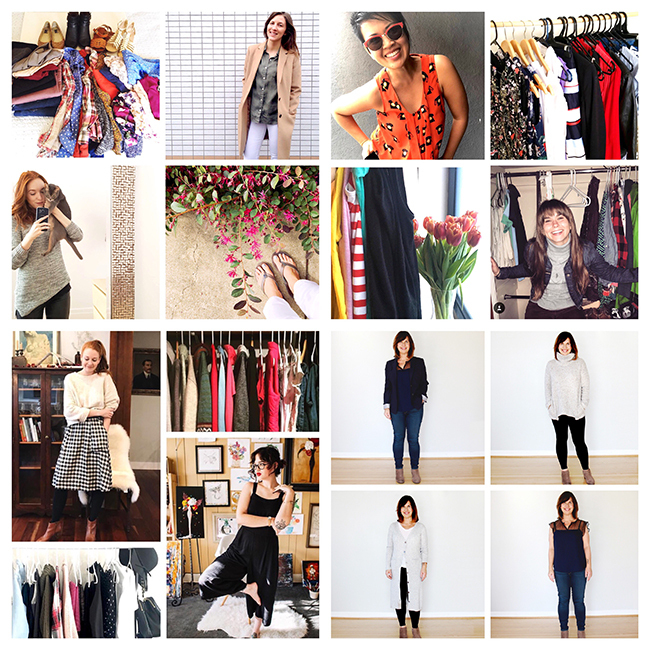 Connect with our like-hearted community on Instagram by searching hashtag #project333 and using it when you share your own closet make-under. People who haven’t tried the challenge often share their fears and people who have tried it, their gratitude. Before I started, I was scared too and had lots of questions and excuses but they all boiled down to me thinking I wouldn’t have enough. Fear will tell you that you will never have enough. When you finish this challenge, you can tell fear you do. The realization that you need way less than you think to be happy will change your life in the most amazing ways. Hi Courtney! I feel like you are my closet spirit animal. Thanks for such a great post and the inspiration. My closet make under starts today! Take care. Yay! Congrats on getting started Laura. I love the concept of project 33 but I am a teacher my clothes need to be a loose version of business casual -no jeans. I also like my “off duty ” clothes to be different. (For many reasons) How would you adapt to this situation? As a teacher my clothes can get dirty with one wear- glue, being on the playground, helping in the lunchroom, so I need several pairs of pants. I wash once a week. Hi Robyn, Everyone is working with different circumstances so I recommend experimenting. Remember it’s a 3 month challenge so if you are willing to be a little flexible and curious, you may discover some new things about what you really want/need in your wardrobe and your life. Love what you are doing! Love your message! Has helped me in so many ways. This is a fantastic process that does indeed set you free! I personally don’t like to do laundry so often, so I have settled for a little more but it all fits in one small wardrobe. Thank you for this. Mornings are so stressful, even when I plan the night before. So many clothes I can’t see what’s in my closet. Many no longer fit. It’s time for a change. This gives me hope. The only rule I slightly disagree with is the “haven’t worn it in a year”. For example, my weight fluctuates a little. Or the season is exceptionally cold/hot/wet. For example, last summer was so cool that I didn’t really need any of my hot weather clothes. And sometimes, I just get bored with a item. When I notice these things happening, I no longer just get rid of the items in question- I feel that would be just wasteful since their being a bad fit for me is just a temporary thing. Instead, I put them out of sight. When the situation changes, I don’t need to go shopping for new clothes that are very similar to ones I have gotten rid of. It’s amazing how spending a year out of sight makes an item look all fresh and new again, even if it’s many years old. I think that usually, if one is honest, she can tell quite accurately whether the reason why something has not been worn for a year (or even longer!) is a real issue with the item or just one of life’s little hiccups. This is so true. We often think the solution is more instead of less — If I find myself discovering clothes and thinking “oh I forgot I had this!” and then still not wearing it, it has to go. I think there’s also a lot to be said about when we buy for our ‘fantasy selves’ who go hiking or do yoga all the time, even if that’s not part of our regular lifestyle. Well, when I first read about Project 333 a few years ago, I really thought it would be too hard. Then I counted my clothes and realized that I only owned 58 pieces total (excluding underwear, socks) plus two pairs of shoes, a hat, a scarf and a pair of gloves. For me, I realized that I’ve got too little. I’m at the point where I wear the same (pretty worn out) sweater twice a week, and I feel uncomfortable. So, this spring I will do another clean up of my wardrobe and then I will create a list and buy what I need to have enough to feel good in every westher without overfilling my wardrobe. I’m glad that there are people like you out there who point out that it’s possible to look good without a huge pile of clothes in the first place, so I know I can do it without spending millions. I’m somewhat of a minimalist, but have been afraid to try Project 333 for quite some time now. Finally, I decided that I would experiment with it beginning this April, and go easy on myself if I found it difficult. So this morning I set about carefully picking out my 33 items for the next 3 months. I had quite a laugh when I made it to 32 items and couldn’t find any other thing I would like to add to my capsule wardrobe. I guess this is going to be a lot easier than I expected! Thanks for the inspiration, Courtney! This post (especially your sample list of 33 items) was very helpful in getting me started. Thankyou for the prompt. I did project 33 a few years ago and it helped me. Recently been feeling overwhelmed and guess what my wardrobes a mess, so ive gone back to basics over a week ago. Im already feeling so much better with a smaller wardrobe and getting on better with all aspects of my life. What do you recommend for people who wear uniforms to work? My job provides each employee with 6 sets of uniforms (tops and bottoms) along with 2 jackets. They are all identical and required for my job. That’s a total of 14 items (almost half my 33!) that I have no control over! Not including them feels like cheating, but it makes the challenge more difficult. Would you count them or not? I recommend counting uniforms as 1 item in your 33.
wardrobe! What advice can you offer about a capsule wardrobe for a child? My son is almost 5 and has accumulated a great deal of clothes thanks to his grandparents and aunts. The problem is that he has more than he needs or wears and ends up making a huge mess in his room everyday, as he changes his clothes whenever he feels like it! I’m working on getting him to stay in the same outfit or two for the day, but I definitely want to reduce the number of pieces in his drawers. What are your thoughts?